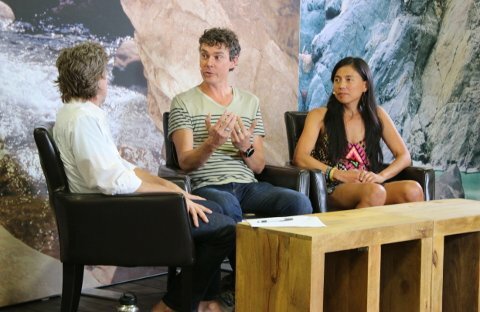 Scott Jurek appeared at the Outdoor Retailer Summer Market convention this week to answer the one question on everyone’s mind: Why on earth would someone punish themselves to such extremes? Jurek broke the Appalachian Trail thru-hike speed record in 46 days, eight hours and seven minutes. At 2,160 total miles, that amounts to an average pace of more than 46 miles per day. After the first week on the trail Jurek said he worked through several injuries. He had pain in his right knee and a torn quad in his left leg. With spirits high on adrenaline, Jurek could hardly limp down the trail. But instead of quitting, he pushed through and walked 37 miles one day and 39 miles the next while his body miraculously healed itself. “Gradually my body found a way to heal itself on the trail. Each day got a little better,” he said. During the course of the interview, Jurek revealed his journey on the trail was as much mental as physical. With such a daunting task ahead of him at the beginning, it was easy to be overwhelmed. Many days Jurek would spend 15-18 hours on the trail – when he was trying to make up time even 26 hours – sleeping for no more than an hour and a half on many occasions. Toward the end, fatigue was so great that he could sleep virtually anywhere, even on top of rocks. And he was burning so many calories, roughly 10,000 per day, that he lost muscle mass and had trouble standing at times. For his wife Jenny who provided support along the way, seeing Jurek suffer was difficult. Ron Tipton, who heads the Appalachian Trail Conservancy, applauded Jurek for his accomplishment, but he worries about the impact. As a result of the film Walk in the Woods starring Robert Redford, which premieres this week, the Appalachian Trail will receive a surge in visitors. When the book came out by Bill Bryson in 1998, hikers on the trail grew by 60 percent. Following Jurek’s celebration on top of mount Katadan with a bottle of champagne, Jurek was cited by the Baxter State Park officials for drinking alcohol in the park, which is prohibited. Tipton worries others might disregard the rules in greater number and the park might have to restrict the number of hikers. Jurek countered those who argue his feat detracted from the true nature of an Appalachian Trail thru-hike. And then there was the big question: What’s next for this ultrarunner?